This Haldirams Palatable Ensemble is a fitting choice for transmitting your earnest emotions to a loved one you endear and thus deepening your corner in the distinguished heart. 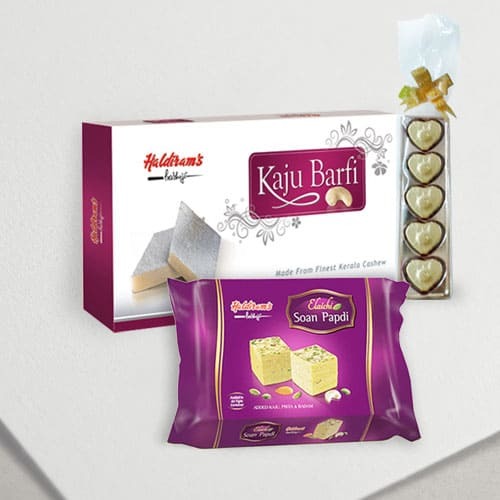 This Ensemble is presented with 250 gm Haldirams Soan Papdi (Gross Weight), 250 gm Haldirams Kaju Katli (Gross Weight) and 5 pcs Homemade Chocolates. Flowers Delivery Surat, Send sweets Barmer, Wedding Cake Gopi, Diwali Mithai Tiruchirapalli, Send Flowers and Gifts to Ankleshwar, Online Shop Vijaywada, Flower to Calcutta, New Year Flowers Amritsar , Fresh Fruits Ramgarh, Send Gift Kannur, Dry Fruits to Gurgaon, Birthday Delivery Bareilly, Sending to Hissar, Flower shop Lucknow, Bhopal Online Cake Delivery.